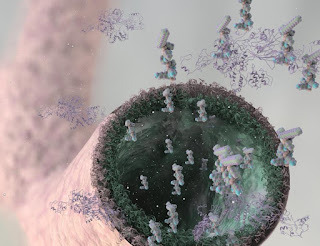 molecules into complex tubular tissue-like structures. ﻿Researchers have developed a way of assembling organic molecules into complex tubular tissue-like structures without the use of moulds or techniques like 3D printing. The study, which is published in the journal Nature Chemistry, describes how peptides and proteins can be used to create materials that exhibit dynamic behaviors found in biological tissues like growth, morphogenesis, and healing. The method uses solutions of peptide and protein molecules that, upon touching each other, self-assemble to form a dynamic tissue at the point at which they meet. As the material assembles itself it can be easily guided to grow into complex shapes. This discovery could lead to the engineering of tissues like veins, arteries, or even the blood-brain barrier, which would allow scientists to study diseases such as Alzheimer's with a high level of similarity to the real tissue, which is currently impossible. The technique could also contribute to the creation of better implants, complex tissues, or more effective drug screening methods. The protein/peptide system can grow on demand by simply displacing the interface. Based on material originally posted by Queen Mary, University of London.